My book Dynamic Reteaming: The Art and Wisdom of Changing Teams is coming along. It might be different than other books that you might have read so far because I am updating it every few days. In the writing of this book, I am attempting to demonstrate what it means to write a book from a Modern Agile approach (as invented by Joshua Kerievsky). Let me explain. You are reading a dynamic work in progress. In order to do this, I have had to exert a fair amount of courage as well as learning how to be comfortable shipping imperfection. I tend to be a perfectionist. I have hand drawn images in the book which are prototypes for final images to come some time later. I have notes to myself for thoughts to add later. I have reminders to add citations. I don’t think any of this gets in the way of the meaning of the book. The meat of the book are the ideas, and that is the value. Some of this other stuff is really logistical. It reminds me of when I taught English as a Second Language. There is a difference between communicating for meaning and communicating with “perfect grammar.” The idea is to communicate ideas, and not worry about using the ultimate syntactic structure. That’s hard when you’re learning a new language because we might get self-conscious and focused on perfection. I can relate to that. The extreme learning here is that for years I have asked software engineers to ship imperfection. I am now feeling what that might feel like and it is empathy building. Moreover, I have the luxury of being my own product owner. Many developers do not get to go back and work on the areas of code that they have released do to changing business priorities. In an ideal world we would all be able to do this, but it’s not always the case. I am wondering if what I’m feeling relates at all to what it feels like to have your code, your features, your love go “out there” without the opportunity to revise or change it due to whatever constraints. I can feel more now that it wouldn’t always be easy. Actually worse than this is when your product gets cancelled forever and you can no longer work on it. I had this experience at expertcity.com when we were building our marketplace for experts. I was on the web development team. We had so many hopes and dreams for future features. I created web flows with engineers for some of the new features. The marketplace product failed, and we were told that we can’t work on it anymore. I actually cried it hurt so much! As a junior person at the time I couldn’t comprehend the severity of the situation to the company’s survival. This was all pre-lean startup, pre-Steve Blank and so the concept of the pivot was unknown to me. Fortunately I was able to be part of the team that built GoToMyPC (predecessor to GoToMeeting and GoToWebinar), and now years later I have the perspective to understand the awesome strategic vision of our management team at that time. How we reteamed to build the initial version of GoToMyPC is in my book as one example of the Innovation by Isolation pattern. To Deliver Value Continuously I’ve figured out a flow to get my words from Scrivener on the Mac, over to Leanpub. For those interested, it works like this. I have a Scrivener project going. Each chapter is an individual text file. The name of each of the files in scrivener equal to the names of the files in my Leanpub dropbox folder. I export the manuscript from Leanpub which copies over to a different dropbox folder. I copy and paste those files over to the appropriate Leanpub folder and list any new chapter additions in book.txt in the Leanpub folder. (Ideally this would go directly to the Leanpub folder but I haven’t done that yet). Then I go to Leanpub and generate a preview. That takes forever, but I wait. Then, I review the files in there and if they’re good to go I publish in Leanpub. I’m writing this here because I couldn’t find any help on how to do this on Leanpub, Scrivener nor Google. So maybe it’s helpful to someone out there. I’m looking for more feedback on my book so that I can iterate based on more authentic feedback from readers. If you are interested in being an active reader of my book, let me know and I’ll send you a coupon to get a free book. Contact me heidi dot helfand at gmail dot com. I’ll add you to a special community of active Dynamic Reteaming book participants. Leanpub asks for a “percentage completed” number. That’s a bit challenging for me. The structure of this book is still changing at the macro level. Also, as I gather more and more data from interviews in which to derive the reteaming patterns, I’m learning. I’m experimenting with different organizational structures to the text. I’m not satisfied yet. As of the writing of this post I have 2 interviews out to be transcribed and 4 already transcribed to integrate into the text. I’m seeking out more companies to talk with who have stories to tell about how their teams have teamed and reteamed. Know of anyone? I’d love to hear from you. I have interviewed countless people for countless hours to get real, world, industry stories about how their companies have teamed and reteamed. My first recording had sound issues. I learned the hard way that I should have tested the sound before doing an actual interview. It could have been worse – it was only one interview, and I was able to transcribe the data effectively but still as a perfectionist that troubles me. I have been taking great care to get permission from people who are sharing stories in this book. I’ve also taken great care to hold anonymity of the participants sharing stories that for them might be uncomfortable. This also ties into *Making my Participants Awesome*. 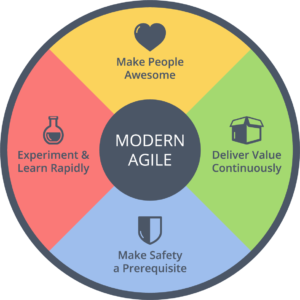 I have been very fortunate to be involved in the Modern Agile community and to have the support of people like Joshua Kerievsky who has been an incredible thought partner for many of these ideas, especially the concept of what patterns are and how to write them up, as well as the whole Modern Agile topic that he started. Michael Kelley Harris has been such a thoughtful friend actually bringing me recording devices to try out in the early days of this project so that I could solve and make better recordings. Vasco Duarte told me how to record Skype interviews. And I’ve discovered along the way that Zoom video recording also works well. I’ve got a flow to a transcription company to get my interviews transcribed and it only takes a few days. Friend have introduced me to people to interview. Participants have contributed valuable hours of time to be interviewed. It means so much to me. I have been able to introduce participants to each other who are experiencing similar reteaming patterns in their companies. As a connector that gives me a lot of satisfaction.